We survived the snowpocalypse of 2014-2015 with no power outages. And yet, this past Thursday, we lost power twice for no reason. Usually this is no big deal (unless you are 8 months pregnant and have to climb 7 flights of stairs in the dark to get home), but it took on new meaning with a new baby, an oxygen tank, and acid reflux. Evie and I were watching a movie (Labor Day--don't bother) while Erick was at the gym, when all of a sudden the power went out. 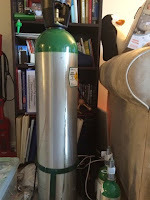 I had always kind of chuckled to myself that we had a 60 lb oxygen tank sitting in our living room as backup, but now I understand why we have it. Then I hooked her back up to the regular oxygen condenser, and then 2 hours later, the power went out again. Evie entertained us during the blackout with cute baby faces and cooing by candelight. What a night!